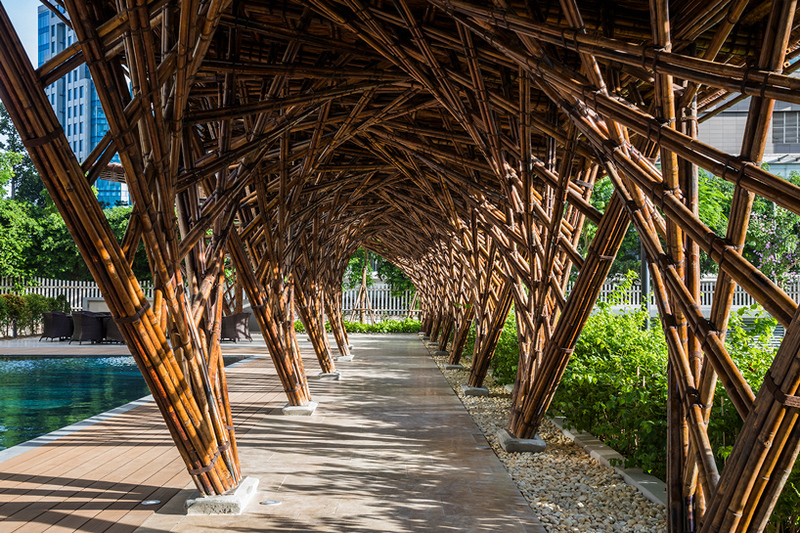 VTN architects (vo trong nghia architects) crafts the ‘vinata bamboo pavilion’ in the city center of hanoi, vietnam. 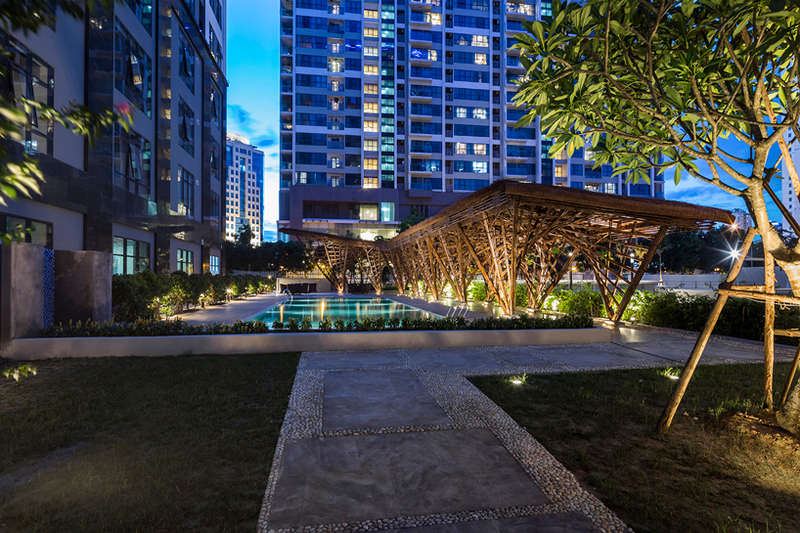 while the area is characterized by its density of high-rise residential buildings, the pavilion serves as an outdoor communal space in the garden of one apartment. 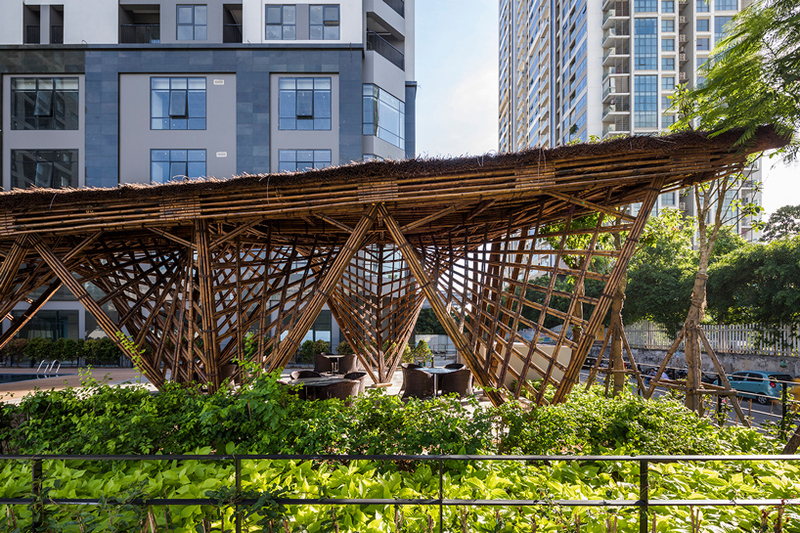 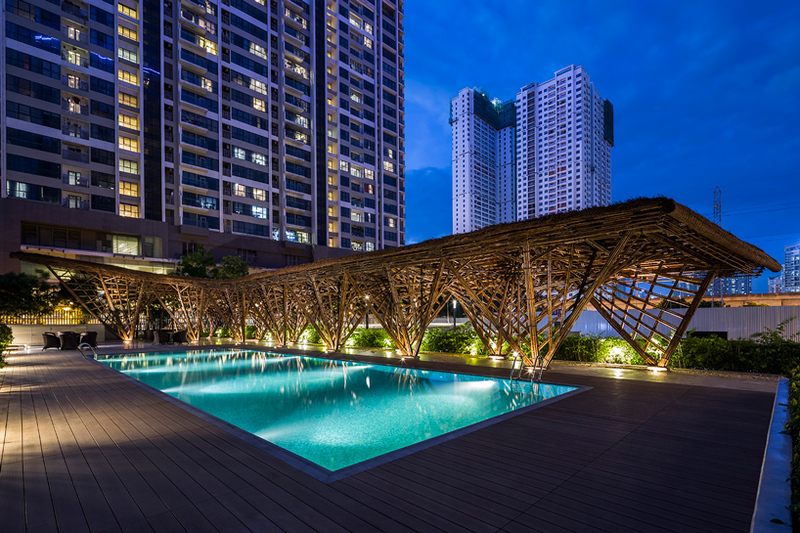 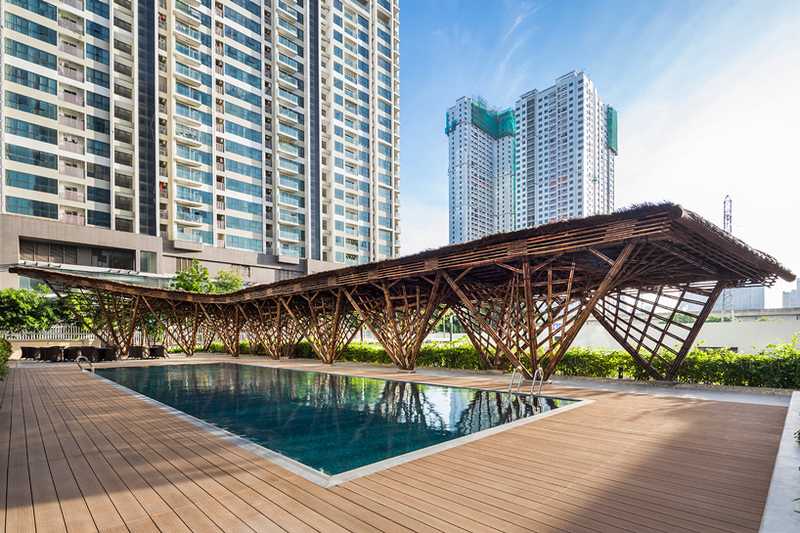 as four tall buildings overshadow the site itself, VTN architects introduced the bamboo structure to offer a bucolic oasis integrated with plantlife, offering a peaceful atmosphere and an environmental landmark within the highly dense urban area. 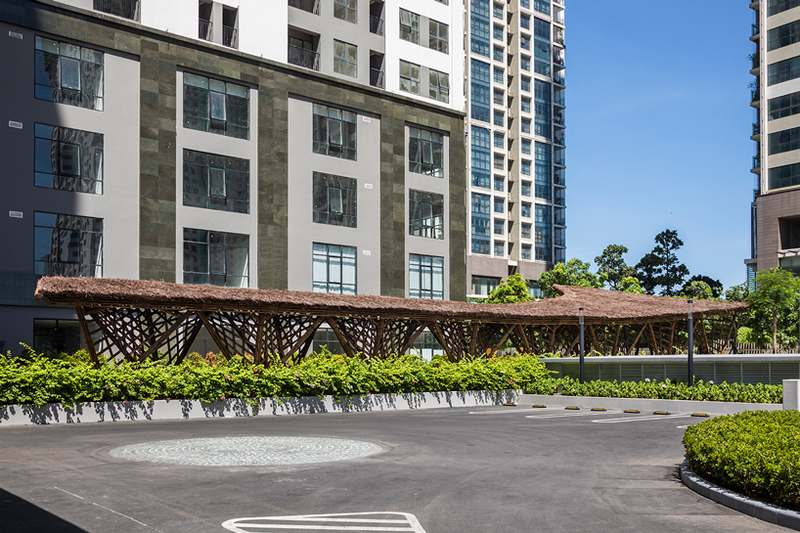 with a length of 38 meters, VTN architects’ vinata pavilion welcomes residents at the entrance of the site. 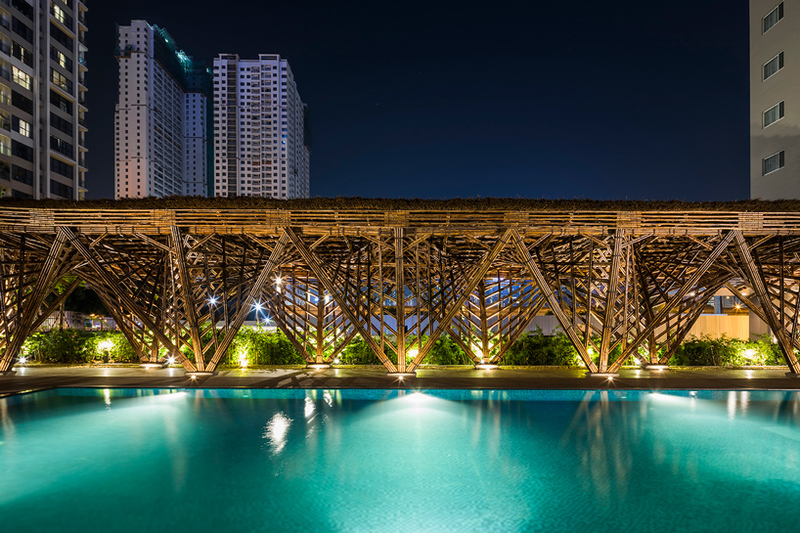 the pavilion can be accessed from the lobby which overlooks the garden and the pool. 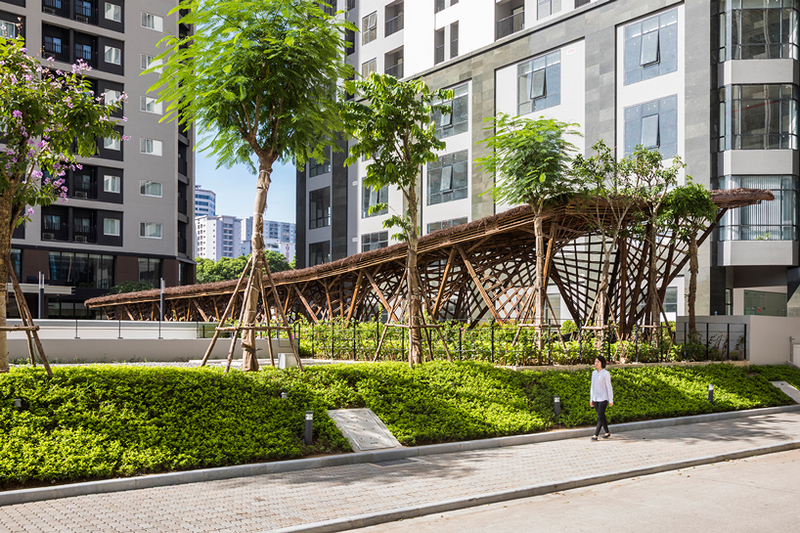 the bamboo structure with the bordering ‘bougainvillea hedge’ was designed to introduce a gentle boundary between the property’s parking space and the semi-private garden. 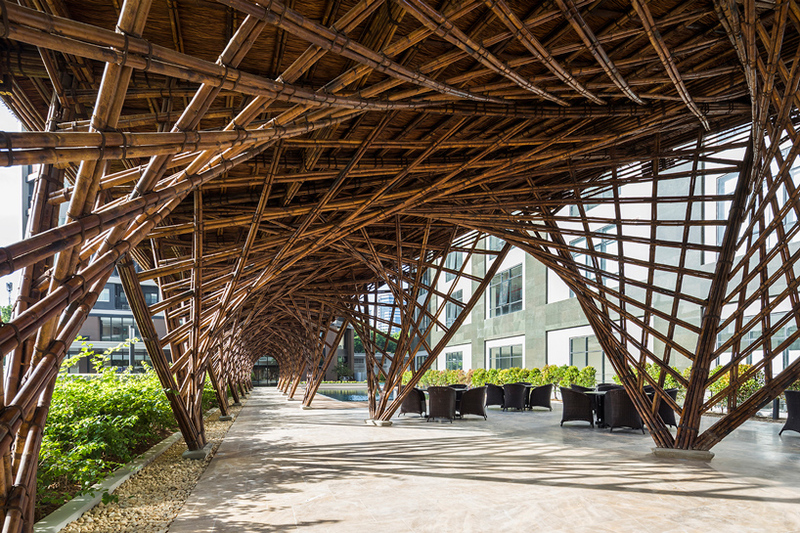 the pavilion is comprised of 14 modules, each designed as a combination of two hyperbolic shell structures. 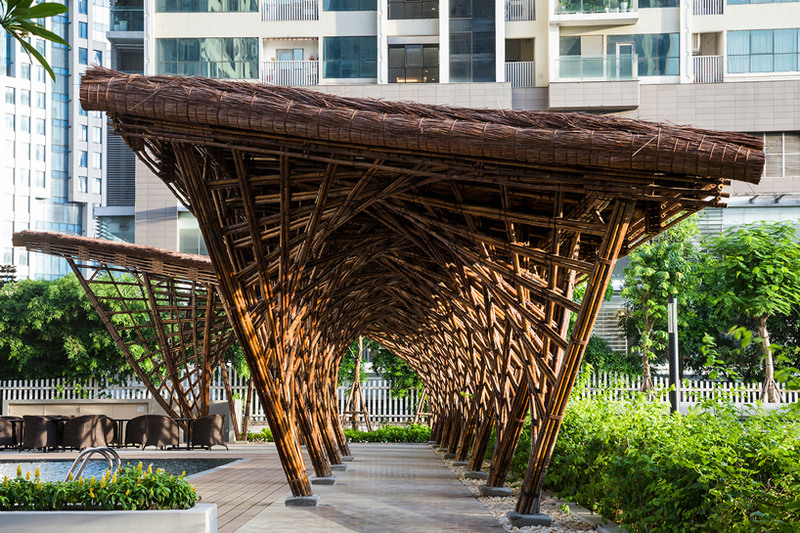 this method results in a promenade of rhythmic twisting elements of exposed bamboo structure. 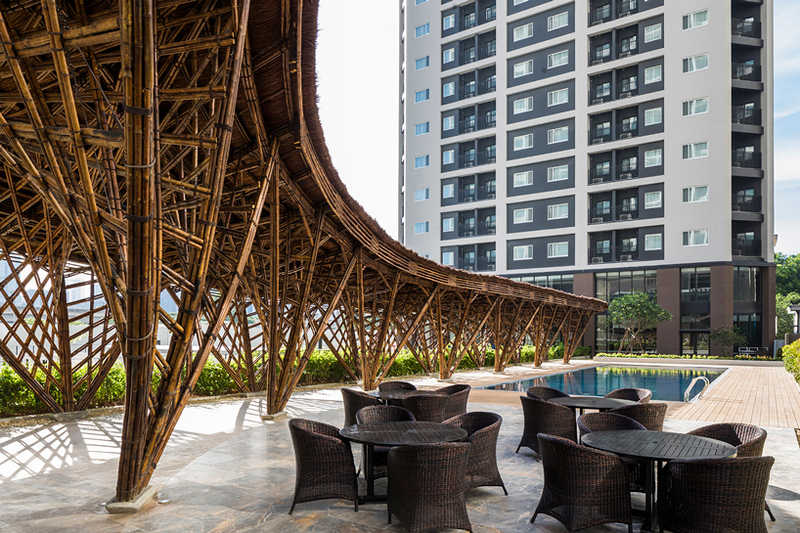 the thin ‘tam vong’ bamboo poles each measure approximately 50 mm in diameter. 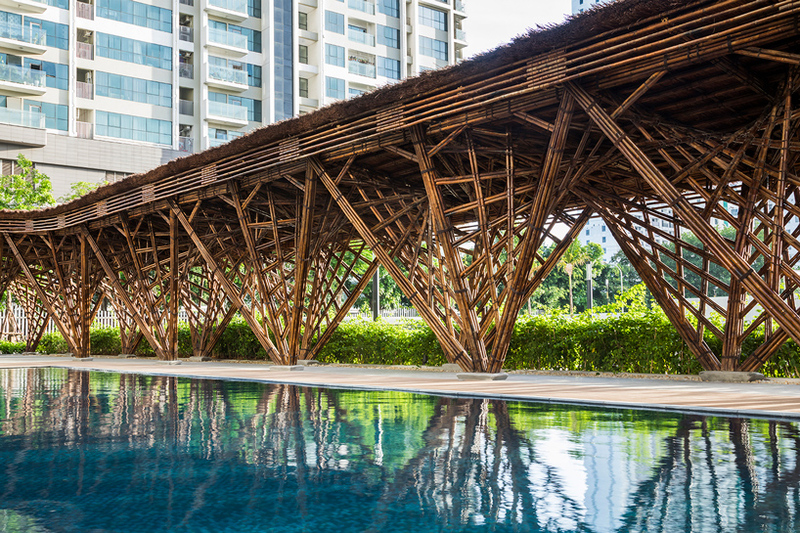 the assemblage is constructed through the use of bamboo dowel nails and tightened by rope. 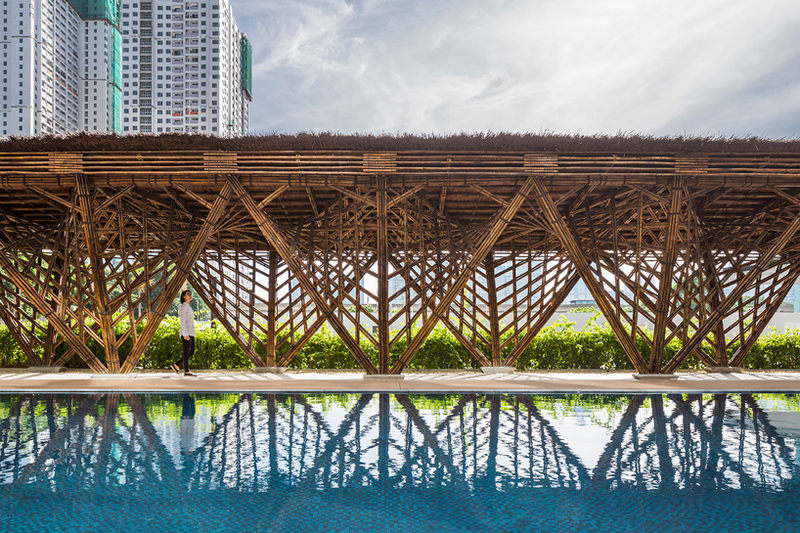 the complex hyperbolic structure casts delicate gridded shadows as it traverses the edge of the poolside. 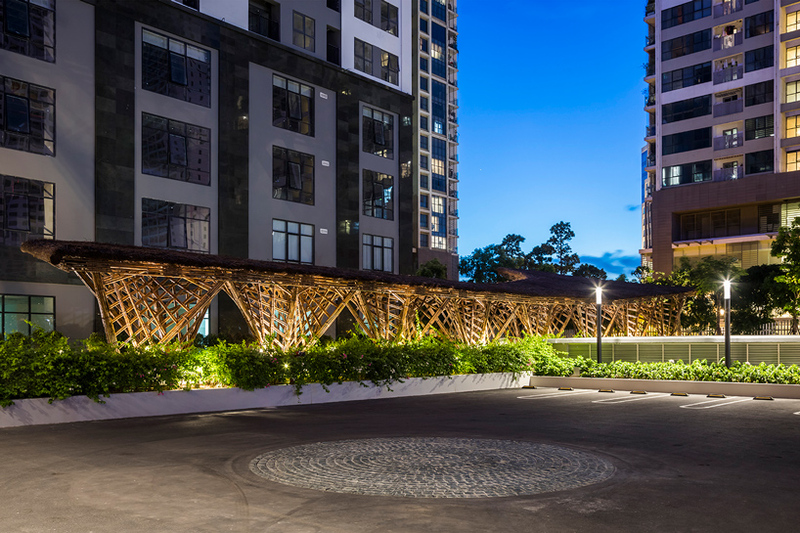 a gently curved thatched roof encloses the space, protecting residents from direct sunlight which penetrates the garden between the surrounding high-rises. 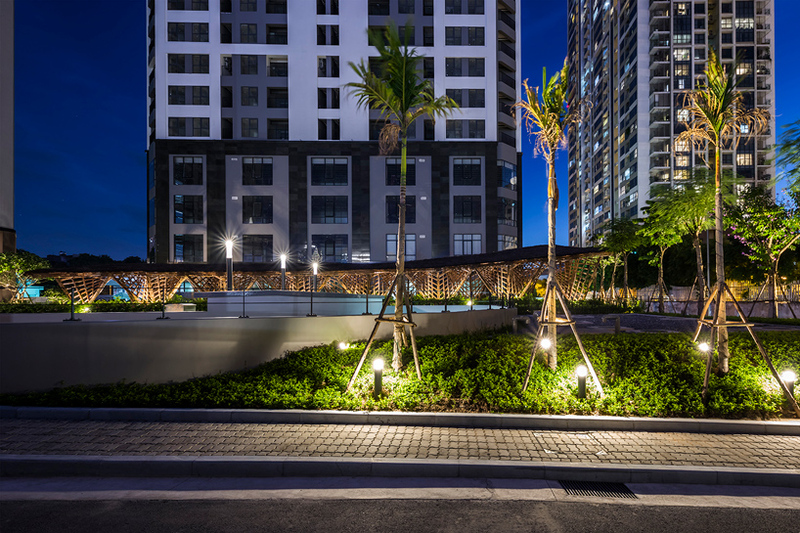 the social garden space offers the site an identity within the urban neighborhood as entrance of the complex structure is visible from the street.